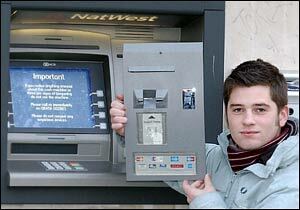 Undetectable fake ATM keyboard steals PINs in real time ! Thieves and scammers are an inventive bunch, especially when it comes to stealing you money indirectly. And the latest discovery of a fake keyboard that is placed over an ATM's legitimate one and records the typed-in PIN - in conjunction with a fake magnetic strip reader that can be manufactured from cheap spare electronic parts - shows that this kind of crime does not require a lot of funds and can bring in quite a lot of money. According to Gizmodo, the keyboard is virtually undetectable by anyone who is not an expert, and looks exactly like the real thing. It records the PIN as you type it in and sends this information and that regarding the credit card magnetic strip to the criminals in real time, so they can immediately proceed to emptying your account. US ATM users are particularly susceptible to these type of theft, since many ATMs work on the same principle. The chip-and-PIN technology used in Europe is harder to crack, so a number of US banks have started adopting it.